Tariq played youth football in modest clubs in Catalonia, such as Racing Blanenc and Vilobí, and supplemented his fluent Italian with Castilian and Catalan. However, he moved to Valladolid due to a family relocation, and made his senior debut with Real Valladolid B at the age of 19. He would compete the 1999-00 season in the Segunda B and the next one in the Tercera with the club, scoring a combined 22 goals. He would play for another reserve team during the 2001-02 campaign, as he helped Espanyol B finish second in the Segunda B.
Tariq spent the following eight-and-a-half years in the Segunda B, with Cacereño (2002-03), Linares (2003), Palencia (2004), Sabadell (2004-05), Águilas (2005-08), Puertollano (2008-09) and Granada (2009-January 2011). In the 2008-09 season he scored a career-best 24 goals, and his achievements, then and in the past, were getting recognized. The time he scored one of the quickest goals in Spanish football - within seven seconds - while at Palencia. The time he became the Segunda B's top scorer with Puertollano. The time he played a charity match in Morocco along Ronaldo and Zidane - and shone despite not having the limelight on him. His performances earned him a a move to Udinese (being immediately loaned to Granada) for 100,000 euros. 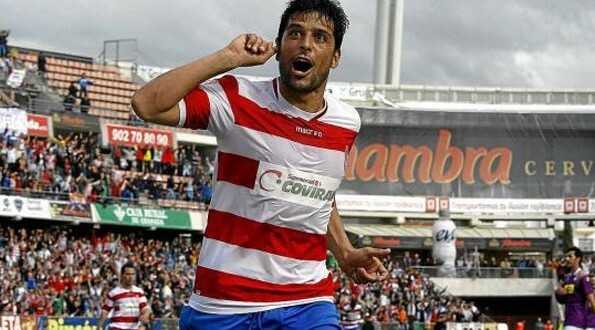 He would add 19 goals for Granada in the 2009-10 campaign, which led to promotion. However, some at Granada were trying to get rid of him, not convinced he could deliver in the Segunda (a division he had not played in), and were trying to swap him with Alejandro "Chando" Torres in the summer of 2010. Nevertheless, no such move materialized, and Tariq was simply frozen out of the team in favor of new signingAlexandre Geijo. After just 147 minutes of action across six appearances in as many months he was loaned to Segunda side Huesca in January 2011 via Udinese. Eight goals in 18 appearances ensured the side would retain their league status, and moved to Huesca permanently in the summer of 2011. He would stay there until 2014, enduring a relegation to the Segunda B in 2013. Afterwards, he joined Segunda B side Huracán Valencia in July 2014; however, following his team's disqualification for financial issues in December 2015, he dropped down a league to sign for neighboring Castellón in January 2016. He retired in August of the same year. He was the perfect mix between explosiveness and intelligently timed and disguised runs. But more importantly, he was the perfect representation of the opportunities available to those who seek them. He was the perfect story to capture a footballing dream. And maybe there is more of that story to unfold.